CapEx (Capital Expenditures): Purchasing an asset (factory, computer system, company car) is considered a capital expenditure. It requires payment for the entire asset, and the cost becomes an entry on the company’s balance sheet, depreciated over some period of time. This asset strategy also includes other costs such as upkeep, insurance, and personnel tied to the assets use. OpEx (Operational Expenditures): These expenditures are associated with purchasing services for a planned period of time, for example, 1-3 years. All OpEx payments during this period count against the income statement and do not directly affect the balance sheet. Some examples of operating expenditures include consulting services, building rental/lease, sales, utilities, cloud computing services, and rental car fees. Costs for these services usually cover all expenses associated with the services. How does CapEx/OpEx relate to enterprise data infrastructure and services? By maintaining on premise computing and storage infrastructure, you’re investing capital in an estimation of the computing assets you will need in the future. Companies choosing to stay on premise face the possibility that if they don’t invest enough, their computing capabilities will be limited, i.e. search, storage, computing, which in turn can cause business issues. If they invest too much and don’t use the capabilities fully, they then have spent money on unused capabilities that could have been invested somewhere else. With cloud- based Platform as a Service (PaaS), organizations use and pay for exactly what they need. This reality by itself provides an obvious cost savings. A well-known cloud analyst, characterizes calculating the total cost of ownership as "down and off," arguing that one should always seek to reduce an application's resources as much as possible so long as its functional and performance requirements are met. If an application, or other IT asset, is not used or used only sparingly, the application/asset should be shut down temporarily until its needed again, i.e., when additional demand later surfaces. However, this strategy is not cost-effective in larger organizations due to the complexities of modern enterprises and their ongoing cost of maintaining infrastructure and licenses for the applications. The organizational complexity involved with ongoing enterprise infrastructure management (resource loading, SLAs, etc.) is so high that performing an OpEx vs. CapEx analysis must assume a fully-loaded operation of resources required at application peak load. The company can then use that peak load basis to evaluate the CapEx versus OpEx models. For most companies, it's simply too complex to evaluate in any other way. The bottom line is that companies want to pay only for what they use – period. Cloud service providers allow organizations to adopt a “pay as they go” model (OpEx model) which enables companies to engage the resources and expertise of cloud hosting experts, take advantage of new capabilities faster without the needed investments, i.e. machine learning/AI, pay for what they use, and realize cost benefits throughout the year. Calculating the TCO for Cloud services versus that of remaining on premise is straightforward - determine what capabilities your organization needs; storage, HSM, search, information management, higher security, and disaster recovery (among others) and negotiate a contract with the cloud vendor. However, to simplify the calculations, we can include additional costs in the cost of hardware/software by fully loading the asset costs. For example, the fully loaded cost of storage would be much more than the basic cost of the actual disk drive. The fully loaded cost includes daily backups, additional personnel needed for operation, floorspace, and disaster recovery/failover capabilities. The following on premise example is calculated over three years and includes 50 TB of storage. Without going deeper into each individual calculation, you can see the charts below show an 89% cost savings. 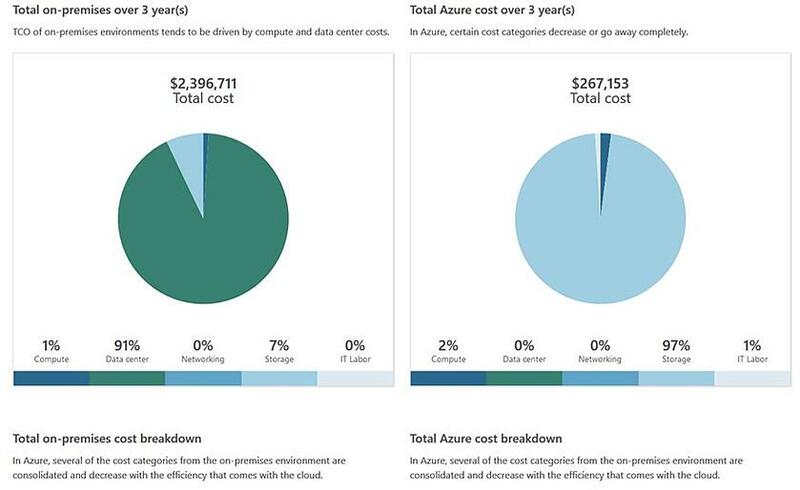 To perform your own “what if” analysis, visit the Azure TCO calculator. Circling back around to the original question of the blog around CapEx versus OpEx strategies, its obvious that moving from an on premise infrastructure to the cloud - from a CapEx strategy to an OpEx strategy - will save your organization a great deal of money. But be aware, your mileage may vary so its always a best practice to run the calculations yourself for your specific circumstance. Archive360’s Archive2Azure is a native Azure information management and archiving platform that works hand in hand with the Azure Cloud providing organizations a viable alternative to a costly on premise computing infrastructure. If you’re pursuing a digital transformation strategy which includes moving your data centers to the cloud, Archive2Azure and the Azure Cloud is the way to go.